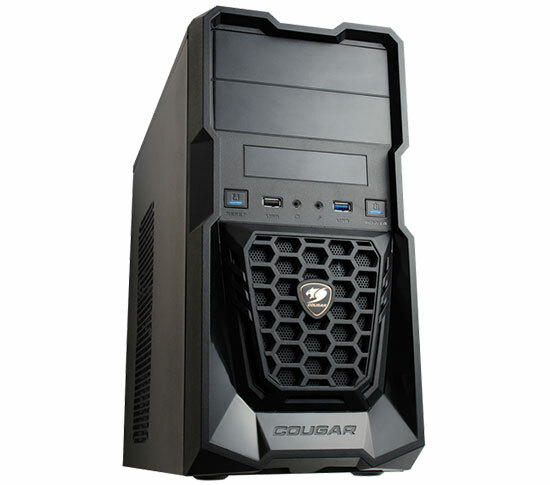 Cougar Spike Micro-ATX PC Case Review - Legit ReviewsCougar Spike - The $25 Micro-ATX Case! Cougar Spike – The $25 Micro-ATX Case! When it comes to PC cases, I have pretty much seen it all over the past twenty years. Right now the desktop PC market is clearly in decline, but the one area that is doing rather well this very second is Small Form Factor (SFF) desktop PCs. People have finally realized that they don’t have to use a full sized ATX motherboard to get the performance and features they want! This has fueled the boom of Micro-ATX and Mini-ITX chassis and today we’ll be taking a look at an entry-level Micro-ATX case by Cougar called, Spike. The average selling price on a PC case today in North America is right around $80, but today we are going well below that price point. The Cougar Spike micro-ATX chassis has an MSRP of $39.99, but it is available right now from Newegg for $24.99 shipped after a $5 rebate! That is a remarkable price considering the manufacturing costs, shipping from Asia, retailer markup and then shipping to your home. For $24.99 you might be wondering what you get and to be honest, it’s not half bad! The Cougar Spike measures in at 180mm x 370mm x 425mm (LxHxD) and is clearly designed to be a mini-gaming tower. If you want something that will fit in tight places or easily be taken on the road to college or LAN parties this is certainly an easier to handle form factor! The Cougar Spike is blacked out on both the exterior and interior to go after the gaming enthusiast. The front grill has a nice large mesh area for fresh air intake and the Spike can handle up to a 200mm front fan, but sadly one is not included here. The Cougar Spike supports up to five cooling fans, but it only comes with a single 120mm fan mounted on the rear of the chassis. This was obviously done to keep the costs down, but this is expected for a sub $30 case. One of the interesting things to note is that Cougar did use a SuperSpeed USB 3.0 port on the front panel and while there is just one, it is better than having none! SuperSpeed USB 3.0 port for maximum data transfer speed. Support for longer high-end graphics card up to 330mm. Screw-less mechanisms on 5.25” & HDD devices. Support installing 2.5” HDD/SSD at bottom cover. Other key features are the support of two 5.25″ drive bays, three 3.5″ drive slots (one external) and a place to mount the SSD at the bottom of the Spike. 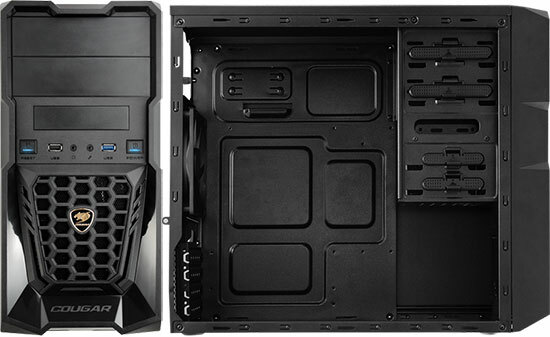 You won’t find any removable drive cages, motherboard cutouts or special spots to route your wires with this case, but they did manage to go with a tool-less drive bay design and paint the interior black! Now that I covered the basics and you know a little bit about the Cougar Spike, let’s take a closer look at the review sample that we were sent from China.